← How Will Occupy Wall Street End? Since starting this blog almost ten months ago, I intended to post this site’s guiding principles. Yet ten months into this experiment, I still haven’t done so. So without further ado, here is the first of seven principles that embody the philosophies underlying Reflections of a Rational Republican. Funnel of Futility – – OK, you’re one for seven – – I’m with you so far, friend. Engineer and Problem Solver – – by education and experience. You weren’t kidding. Former Chief Engineer and Program Manager of the B-2 Stealth Bomber Program? I’m VERY impressed. One of my good friends had the pleasure to fly the aircraft you made possible over Baghdad. Ideology has its place. Ideologues do not. Passion must be tempered with reason lest the ship of state be rent asunder. Passion may be the wind that fills our sails, but reason must be the steady hand upon the tiller, the guide alert upon the bow. Without passion, the ship does not sail; without reason, the ship does not sail for long. Or, in less pretentious terms, when ideology overwhelms rationality, the government can persist in moving for a while, but in the long run, it’s doomed. Without someone to rein in the passions of the government, and the electorate for that matter, the divide will inevitably grow until the system ceases to function as it should. Rather like what happened not too long ago when the government nearly went into default quibbling over what were frankly minuscule changes to a debt problem that requires bold action, not partisan squabbling. Part of the problem is that the ideologue, in theory, wins either way. In the event of failure, regardless of the cause, they can simply blame their opponents, and since neither they nor the people who elected them give two figs about hard data, they don’t have to present any proof whatsoever. Stimulus didn’t work? Stimulus was too small. War on Drugs doesn’t work? We just need to crack down harder. To be honest, it’s part of what troubles me about the increasing extremism in American politics, and what I perceive as the media’s attempt to enthusiastically fan those flames. Passionate ideology could be damaging enough; cynical ideology could bring the entire thing grinding to a halt to further a handful of shortsighted political careers. You really ought to start a blog. You write very well. In fact, you are more than welcome to write for this one if you are up to the task. Pragmatic for what end? The ideology determines the objectives, the goals, the “good”. Otherwise, data-driven-decision-making is blind. We are partisan because we are in the midst of a great national dispute over the proper ends. The progressive agenda which has dominated our ends since the late 19th century. Progressive ideology used by data-driven-decision-makers have piloted us, with some detours, to where we are today. Our partisan quarrel is beyond data and about values. There is no way to move non-controversially from “what is” to “what ought” . I think your funnel of futility ought to be modified to be an X shape, wide at both the bottom and the top, because Data-Driven and Ideological are both ideologies (small I).. Additionally, consider an horizontal X, wide at the left and right sides. And rather than crossing straight lines, the four lines ought to be curved and approach tangent at the horizontal and vertical axes. 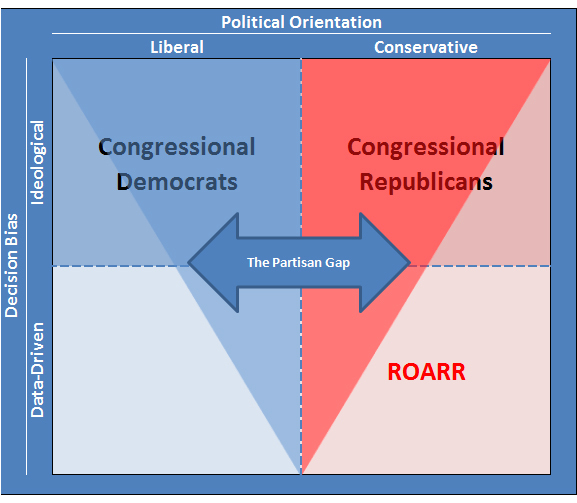 It is in that space that the common ground is found and republican (small R) and democratic (small D) accomplishments take place. (I’ll try to put together a graph later). Ideology will always be in the background, even for the most rational rationalist. I believe that when it comes to the big ideas above visions for America, the ideologues are useful. However, when it comes to implementing ideas, I will believe pragmatists are superior in almost every way. Take Alabama, for instance. The government there is rigorously enforcing anti-immigration laws after ignoring them for a number of years. Now, family farms can’t find enough legal labor to keep their concerns going. Ideologically, I agree with the policy. Farms should not employ illegal immigrants. However, the reality is that they do. A pragmatist would recognize the reality of the situation and devise a practical compromise. Create a guestworker program to confront the reality on the ground in a way that enables the government to accompish a legitimate objective in the least harmless way. Alabama is learning this lesson the hardway. It sounds like you are describing an hourglass-like shape, no? I agree with you on the need for balance between ideologues and pragmatist. In my local Republican Party, I am both a staunch conservative and a RINO, Actually, I am starting my own splinter , the RHINO’s . Hour glass, possibly, depending of the formulae for the curves I am going to have to remember some algebra to draw them properly. The area surrounding the origin of the axes is the region where pragmatist and ideology can move forward.